About 2 years ago I bought a second hand but good condition Strida which has been working fine, this morning without warning it decided to stop working. The problem is the switch which you press with your thumb to release the horizontal bar in order to fold the bike. Since it seized I have once managed to depress the mechanism but after that it has become impossible to use , I use the bike every week and need help finding out how to fix it. I think it might be possible to repair the mechanism - but that is anyway tricky. Re: How does the bottom bar latch work? Hi Bykee, is it the spring and latch that doesn't work or is the bottom tube stuck on the locking latch? If the bottom tube is stuck on the latch then loosening the two bolts, re-positioning the latch and tightening the bolts may solve your problem. Locktight on those two bolts is important and do not over tighten them. 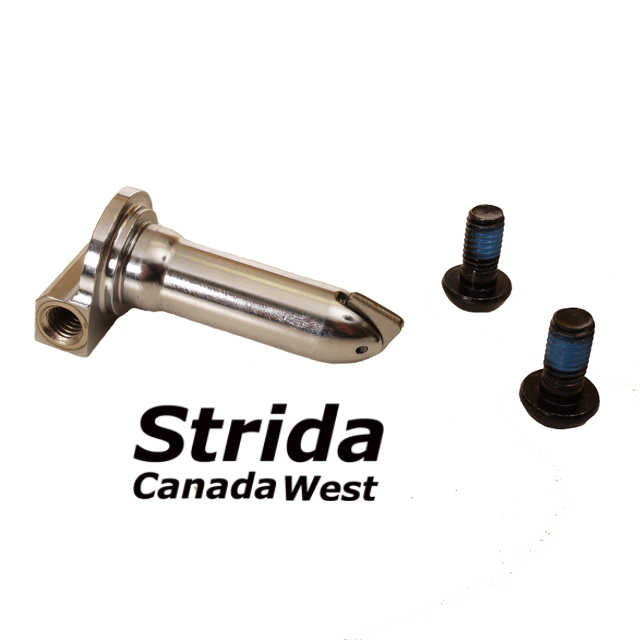 If you need to replace the locking latch I do stock them as BlackStridaAustria provided a link.